Foliage Type: Two large green leaves 1-1.5" long divided into three leaflets. Emanate upward from a single stalk providing umbrella-like shade for the flower. Flower Form: Tiny green to purple flowers. 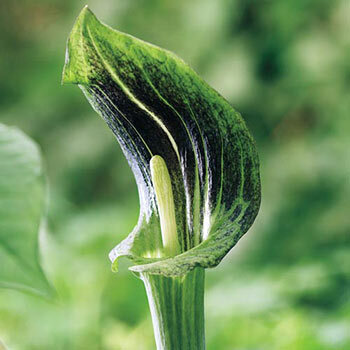 Spathe is green or purple and the inside is usually striped purple and greenish white. Soil Requirements: Fertile, medium to wet soil.